It wasn’t always the case, but these days our first stop when we go to the Nuremberg Toy Fair is usually the CMC stand. Whilst most of the big players are content to turn out replicas of modern BMWs, Audis, Porsches and Mercedes, CMC has realised that collectors are more interested in classic subjects. Nobody is going to supply them with a CAD file, so CMC has to make its models the hard way; finding a perfect example, taking hundreds of measurements and thousands of photos; and then using research to get the details for a particular race or model totally correct. The big news on the CMC stand this year was that they would indeed be producing the Ferrari version of the D50; and to our delight, on display were three different Fangio cars from his 1956 world championship winning season. We’re not going to waste time or space by telling everybody how exquisite CMC’s models are. Most collectors know that already. Instead, we’re going to tell the story of the three cars in question, as they all have fascinating histories. Financial problems and the tragic death of Alberto Ascari shortly after the 1955 Monaco Grand Prix finally put an end to Lancia’s ambitious plans to become a player in Formula One. In a deal brokered by Fiat, the Lancia D50 fleet, together with the blueprints, documents, tools and spare parts was turned over to Ferrari. It was a stroke of exceptional good fortune for Enzo, as the D50 had amply demonstrated its worth. The icing on the cake was that the chief designer, Vittorio Jano, also formed part of the package. Ferrari immediately set about modifying and improving the car. The independently mounted side tanks were removed and replaced with curvaceous bodywork that concealed the exhaust system. Engine output was increased to 255 horsepower. The external oil coolers were replaced and changes were made to the subframe and suspension. Finally, Enzo moved the cars over to Englebert tyres. After Mercedes withdrew from racing at the end of 1955, Juan Manuel Fangio found himself unemployed and looking for a new seat. 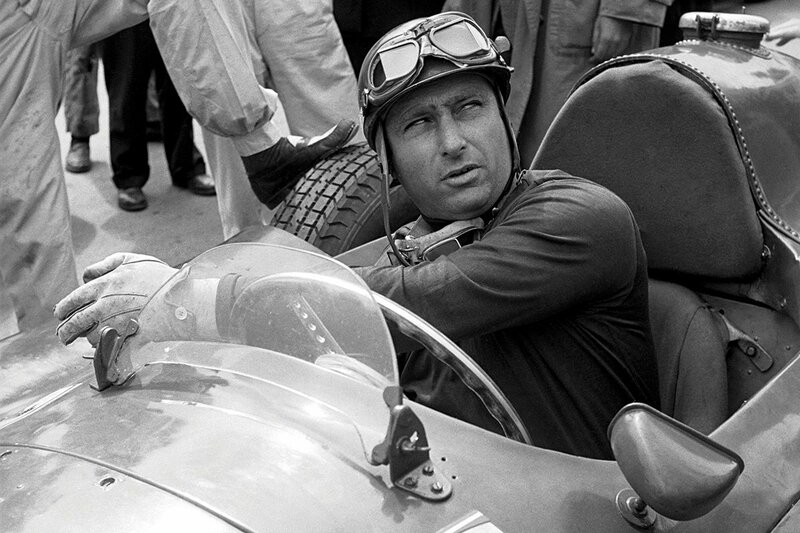 Ferrari welcomed him with open arms, putting together a team that included Musso, Castellotti and Peter Collins. Silverstone was the sixth round of the 1956 championship. The race would consist of 101 laps. Ferrari and Maserati were the two main contenders, and both teams sent four cars to the race. 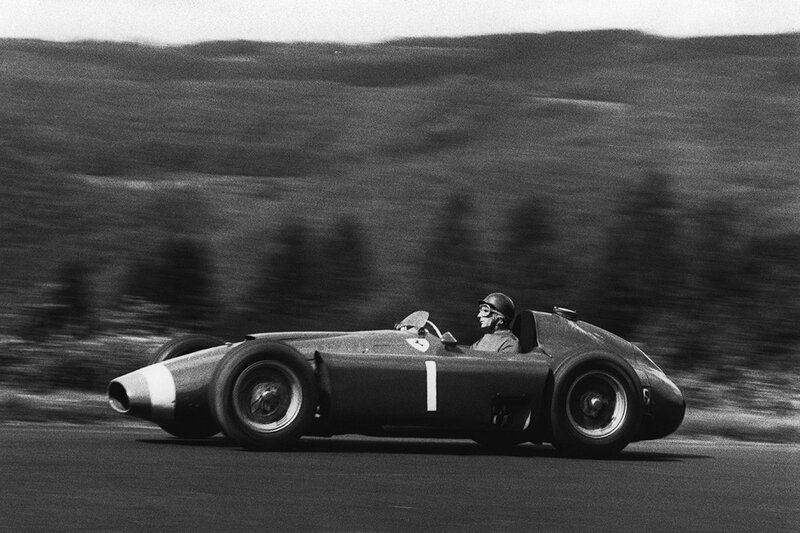 All the Ferrari D50s were short-nose variants; Fangio’s car was painted with starting number one. Another entrant was BRM. Local team Connaught also turned up for the race, as did the French racing team Gordini. 28 cars lined up on the grid, although only 11 would cross the finishing line. Moss in the Maserati qualified on pole, and took the lead, but he lost time when he stopped to refill with oil. On lap 69 Fangio took the lead. Shortly before the end Moss refuelled, leaving Fangio to enjoy a reasonably comfortable win. It was the first time he had tasted victory at Silverstone. His team-mate Collins finished second for a Ferrari 1-2. The model being produced by CMC is limited to just 1000 pieces worldwide. The recommended selling price is £589.99, although as we always do with CMC, we are rounding their price down a little to £564.99. The code for the Silverstone car is (CMC197). In terms of the timing, CMC has not committed to any release dates. In fact, technically, they have not even confirmed that this will be the first of the three Fangio cars to be released, although our suspicion is that it will be. At Nuremberg, we photographed a model that was clearly production ready. So it could arrive in a few weeks’ time, or a few months. The UK importer’s order book has already been closed. He has sold out his entire allocation, the largest part of which is coming to us here at Diecast Legends. At this point in time, supply is not really an issue because we have reasonably good availability, but in a month or so it might well be different. And if you miss out you won’t be offered a second bite of the cherry. Better safe than sorry, in our view. Get your order for the Silverstone car in now if it’s one you want. A year after the Le Mans tragedy of 1955, the German Grand Prix took place. The date was August 5th, and it was the seventh of the eight-round series. Going into the race, Peter Collins was one point in front of Fangio. Behra in the Maserati was a further three points behind. The pace setters were, again, Ferrari and Maserati. Both Fangio and Collins were entered in long-nose versions of the D50. 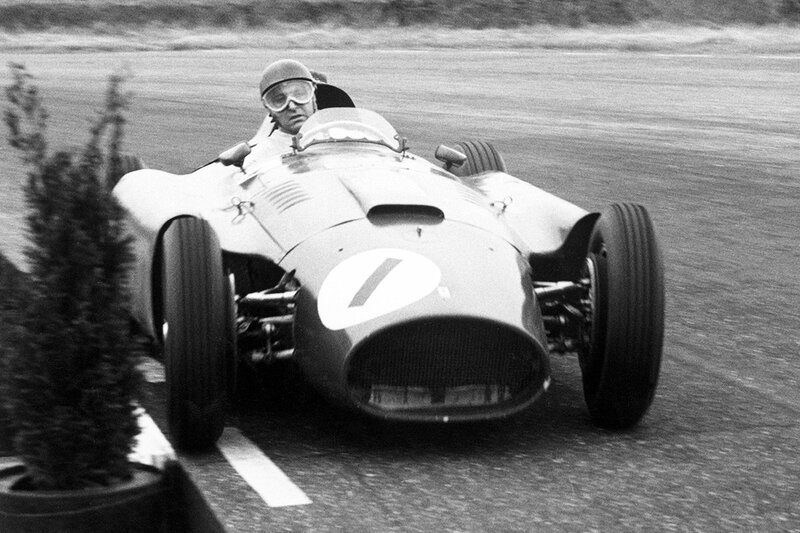 Fangio qualified three tenths of a second ahead of his English team-mate. Collins got to the first corner ahead of Fangio, but before the lap was completed, the Argentinian driver resumed the lead. During the race, Fangio and Collins repeatedly broke the seventeen year old track record, and eventually Fangio set a new record of nine minutes and forty one seconds. The race was to be a war of attrition, and in the end only seven drivers crossed the line. Fangio won with a clear lead of 45 seconds over Stirling Moss. It was certainly a good day for Fangio, who claimed pole, fastest lap and the victory. It also meant that Fangio took the lead in the championship, going into the season finale in Italy with an eight point advantage. As with the Silverstone, short-nose car, we don’t know when the Nürburgring car will be released but, like the other cars, it was finished and production ready at the Toy Fair. The official price will be £589.99. (CMC181), although our price is a little lower at just £564.99. Same story as far as availability is concerned. When it sells out, that’s it. There won’t be another opportunity to buy the car, not unless you want to pay silly money on eBay. The third Ferrari D50 being modelled by CMC is the car that Fangio raced at Monza. The race took place on September 1, 1956, and it was the last round of the championship. The title could have been won by Fangio, Collins, or Behra in the Maserati. Both Ferrari and Maserati sent six cars to the race. In practice and qualifying, Ferrari was dominant. Fangio took pole by eight tenths of a second, ahead of team-mate Collins. In the race, as was often the case, Fangio got off to a poor start. He swiftly moved back into the lead, but on the fourth lap he was overtaken by Moss. On lap 31, Fangio brought the car in for a minor repair, but the decision was taken to send Collins out in his car, and to put the Argentinian into Luigi Musso’s car. But Musso ignored the team’s order, and kept on driving, leaving Fangio without a car. What happened next was quite extraordinary, and testament to the sporting nature of racing in that era. Collins voluntarily decided to pass his car over to Fangio, in an act of deference to an older team colleague. No other driver in the history of Formula One has ever acted so selflessly, and it was perhaps in his mind that, as a younger man, other opportunities would come his way. But it was not to be, as he died at the Nürburgring two years later during the German Grand Prix. 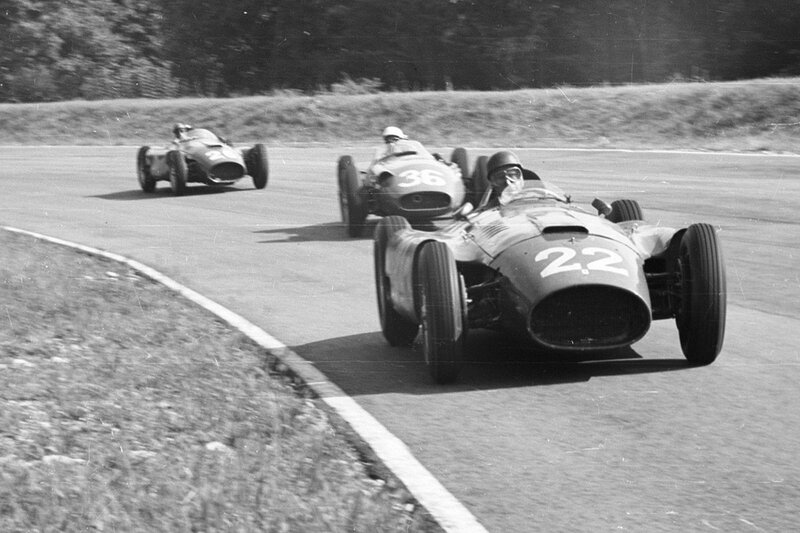 With five laps to go, Moss was ahead of Musso and Fangio who, by then, was in Collins’ number 26 car. And then another exceptional act of selflessness took place. Whilst Moss was in the lead, he ran out of fuel a long way from the pits. But Maserati privateer Luigi Piotti put his car behind Moss’s, and literally pushed him into the pits. Refuelled, Moss overtook Fangio, although the race was still being led by Musso. But Musso then had to retire, passing the lead to Moss. 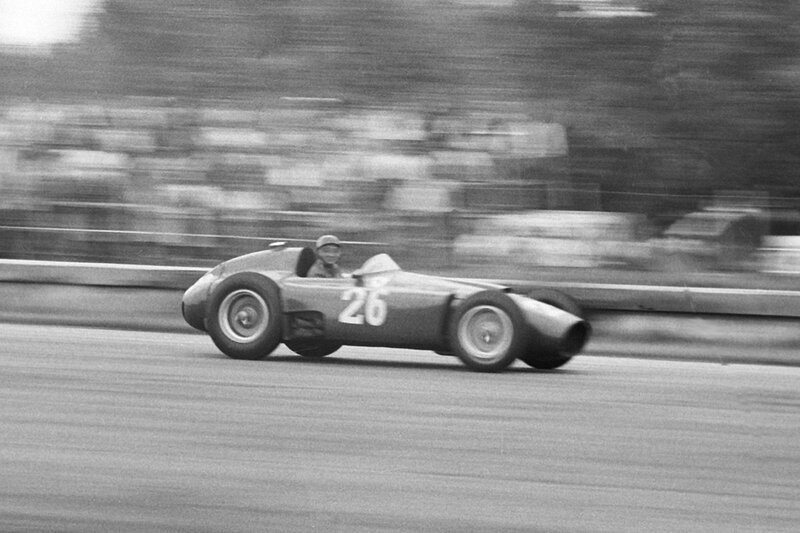 Moss eventually won the race six seconds ahead of Fangio. But with the points Fangio shared with Collins, Fangio took the title to become world champion for the fourth time. All of which means that the car being modelled by CMC is both a Collins car and a Fangio car. It is a limited edition of 1000 pieces and, like the other cars, it is being priced at £589.99 (CMC183). Our price, however, is just £564.99. Again, no idea when the car will be delivered, but we suspect that it will probably be the third of the trio. Realistically, we would expect all three cars to be released by the end of the summer, so that CMC can release at least one of its brand new announcements in the autumn. Now we have always maintained that CMC’s models are antiques of the future. And although their replicas are produced in reasonable quantities, we are more confident than ever that this will be the case. And that’s because CMC’s models are in a totally different league to those produced by anybody else. In truth, even Exoto's models were crude by comparison. When CMC eventually does stop producing models, probably when the elderly owners decide to retire, we’re all going to be left to marvel that models of this detail and complexity were ever offered on general sale to the public. Remember, the number of pieces that go into a CMC car is much greater than the number of components that make up even the most expensive of Swiss watches. CMCs are genuine works of art, and although they are not cheap we are convinced that, if properly looked after, they will only ever become more valuable. We were reminded of the likelihood of this recently when we wanted to acquire on eBay an old CMC model for a project we’re working on. We had to pay almost £1000 for a model that not many years ago would have sold for under £400. When you buy a CMC, you really are buying something special. Keep your CMC models safe, and you won’t regret the money you paid.